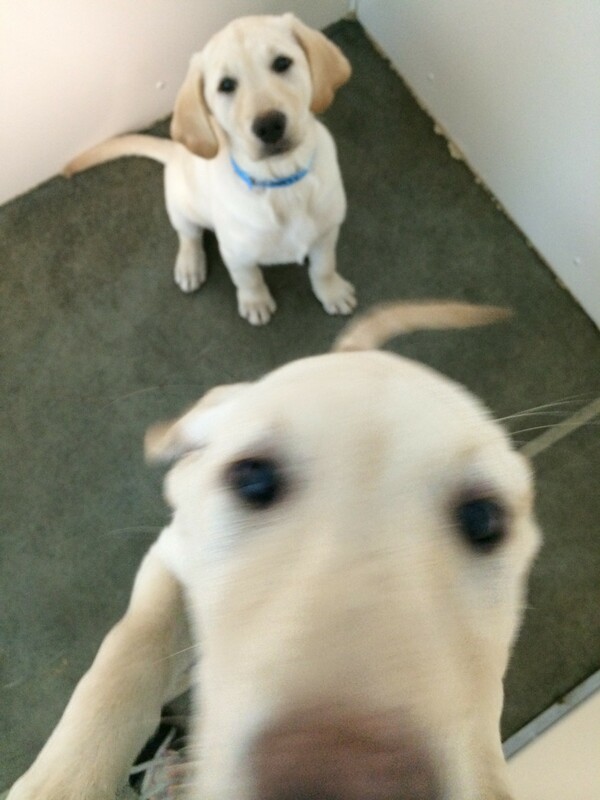 A couple days before Christmas, we were lucky enough to play sitter to two ADORABLE yellow labrador retriever puppies who were to be a surprise for the client’s grandchildren. Fresh from the breeder, the two little girls had yet to be named and were happily nick-named Thing 1 and Thing 2 by the staff (their identification collars actually said “unknown 1” and “unknown 2”). Fast forward a week, and the two little un-named puppies were now called Stella and Daisy. 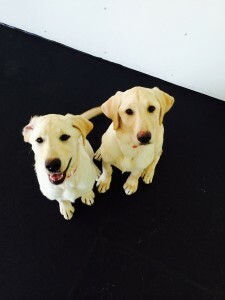 Their dedicated owners scheduled them both for 2 week training camps, although Stella (who went to the grandchildren) started her training 2 weeks earlier than Daisy and has learned extremely quickly! Not to be outdone, Daisy is shaping up to give her sister a run for her money. Stella will go home to her family tomorrow, while Daisy will stay with us for HER 2 week training. After not seeing each other for so long, the girls had an exuberant romp together and then passed out in a shared crate. setting boundaries, structure and expectations and establishing better communication. With practice, consistency and clear and fair leaders, Stella has all the tools she needs in order to be a well behaved canine citizen! One of Stella’s favorite exercises is the recall – she knows that this is one of the last commands that she still receives treats for, so is more than eager to return, even under distraction! She hasn’t quite figured out the concept of how to fetch a tennis ball and prefers to play tug-of-war. This is perfect, since tug is how we teach our “drop it” command! We will see what kind of retrieving drive that Daisy has. We can’t wait to show Stella’s owners all her new tricks and start working with Daisy. I have a feeling we will be seeing a lot of these girls as they grow up! This entry was posted in Crate training, Dog, Dog Behavior, dog boarding, Dog Socialization, Dog Training, Housebreaking, pet boarding, Puppy and tagged boot camp, come when called, Dog Training, dogs, fetch, labrador, labrador retriever, potty training, puppies, puppy, puppy training, recall, training camp. Bookmark the permalink.